Howard Civil Engineering www.howardcivileng.co.uk is one of my clients. I normally shoot big holes in the ground for them either with conventional cameras or from the air with my drones. Recently though the company has moved into being the prime contractor rather than a sub contractor and doing everything on a project rather than just preparing the ground for other contractors to then build on. 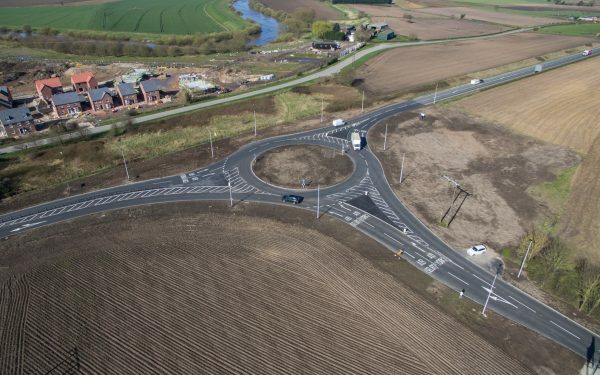 Just a few days ago I was out in Barlby, North Yorkshire to take aerial photographs (Please see the video link below) and aerial video of a new roundabout system to replace a T junction and lights at the A19/A163. Howard Civil Engineering had done the whole project and received accolades from local residents and North Yorkshire County Council alike. I fly under the rules and guidance of the CAA, I am approved by them to fly drones and I am fully insured for aerial operations. The first thing when I get to site is to do a physical walk round to ascertain minimum distances on take off and landing and to check things like cables, pylons, livestock, traffic and pedestrians. Howard Civils had already sought and received permission from the local landowner for me to take off and land in his fields so all that was left was the pre flight paperwork, pre flight checks of the aircraft and a risk assessment.